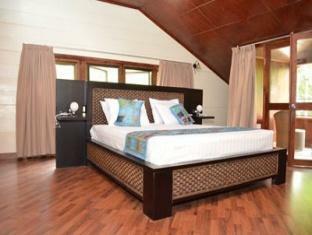 ﻿ L'Oasi Guest House Kepulauan Seychelles. JIMAT di Agoda.com! Ada soalan mengenai L'Oasi Guest House? Terletak di tengah-tengah Pulau Mahé, L'Oasi Guest House merupakan tempat yang sesuai untuk meneroka Kepulauan Seychelles. Dari sini, tetamu boleh menikmati akses mudah kepada semua yang bandar meriah ini boleh tawarkan. Syurga untuk berehat dan bersantai, hotel ini akan menawarkan pembaharuan penuh hanya beberapa langkah dari pelbagai daya tarikan bandar seperti Michael Adams Studio, Studio Adelaide, Antonio Filippin 'Studio Skulptur'. L'Oasi Guest House menawarkan perkhidmatan yang sempurna dan semua kemudahan penting untuk menceriakan pelancong. Untuk keselesaan dan kemudahan tetamu, hotel ini menawarkan pengemasan harian, simpanan bagasi, Wi-Fi di tempat awam, tempat letak kereta, khidmat bilik. Hotel-hotel telah direka demi keselesaan dan memudahkan tetamu. Sebahagian bilik menyediakan internet wayarles, penyaman udara, meja, bar mini, beranda/teres. Sama ada anda peminat kecergasan atau hanya mencari cara untuk bersantai setelah seharian bekerja, anda akan dilayan oleh kemudahan rekreasi kelas tertinggi seperti taman. L'Oasi Guest House merupakan pilihan yang bijak bagi pelancong ke Kepulauan Seychelles, menawarkan penginapan yang santai dan mudah setiap kali. We had a really nice stay at the L'Oasi. The house lays quiet one street off the main road but only a short walk until you reach the beach. The rooms are decorated with so much love and details and the welcoming was really nice. The breakfast is delicious and satisfying and absolutely worth booking!!! The owner has a lot of good suggestions for authentic trips or food and also helps to organize that. We recommend the authentic creole dinner she organizes - its one of the best you can get on the islands! If you're looking for peace and quiet, a wee bit removed from city hustle and bustle;this could be the place. Nearby rest. a bit expensive but once you learn how to "take away" from town, utilize foods to prep at the guest house(items you bought at the store) you'll settle right in. Bus service during the day is a quick and easy way to get go town most days. Yes with a little adjusting and familiarization, this is a lovely place to stay. Service is polite and responsive. Excellent guest house that is clean and we'll maintained. 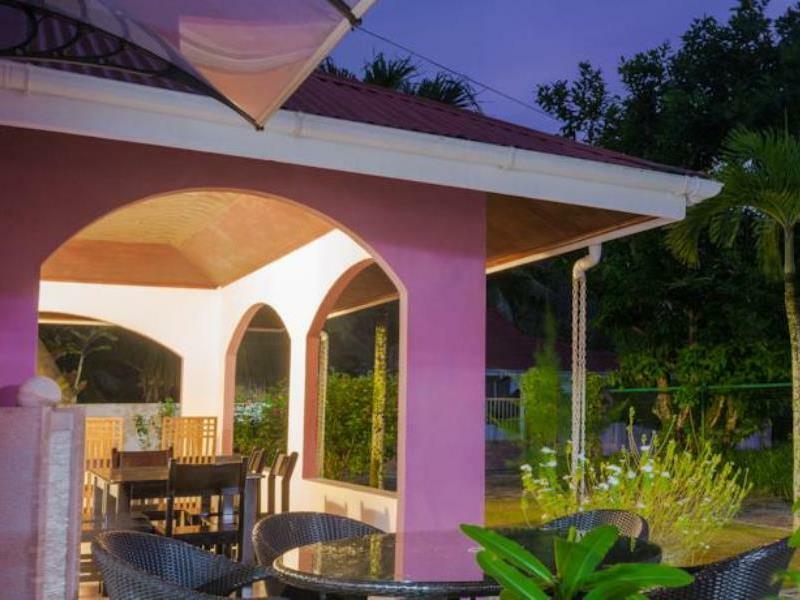 The is a nice entertainment area and the property is not too far from the beach. The owner was friendly and helpful. There are two dogs on the property. Very quiet location apart from some dogs barking at night. I had the room with two 1,2 m single beds, only one of them had a decent matrass without feeling of coil springs (enough for me). The bathroom and shower were nice as was the silent fan and the beautyful terrace to the garden full of flowers. There were 3 giant turtles in a concreted and closed corner of the big garden. The wifi was working after 2 days - weak though. Breakfast was ok, with 2 toast slices, tasty fruit salad, yoghourt, I asked Marilyn, the very friendly housekeeper, for some eggs and got them once. Coffee is unfortunately Nestcafe. Other guests were friendly and did not disturb. The only thing that disturbed me was the loud AC of the upstairs room, fortunately it was off most of the time. In summary, I spend some relaxed 4 days there and can really recommend to anyone who wants to stay central to a bus station going south- or nordwards and remote at the same time. The small street to get there is rather dark at night,it is the same as the Blue Lagoon chalets (see the sign at the main road). It's nice guesthouse but area is not the best on Seyschelles. The best hotel experience in years. Good food and extremely friendly staff. I recommend this hotel. Comfortable rooms. Very nice garden. Big turtles. Friendly staff! It's a very good and quiet place with friendly staff. Very nice gardens and big turtles. No hassle, staff was good. Kept simple no fuss. Location is bit crowded but you'll enjoy if you are more into food loving. really hard tough and uncomfortable pillow. the worst taxi Drivers in the world. Overall Good value for money. very friendly staff, good breakfast, nearby restaurant. very friendly and helpfull staff, always there whenever you need. room is very spacious with lean bathroom. breakfast is very nice and there are 2 restaurants next to it (trust me, it's very important for lazy people like go holiday, and choose self-catering guest house) and it's easy to get the bus to Victoria. and there is a PADI diving centre in 3 minutes walking distance. compare with the price in this Island, it's very worth to stay. Everage. I stay for short period. Location is nice. Beach is very near. Extend one nite to this hotel. Enjoy to stay in the hotel. Not so much corious. Breakfast can be improved.good for solo traveller and short stay. Clean room are. I will advise my friend to stay in this hotel. You can't beat the price, which is very reasonable for a nice guest house including a great breakfast. It is not near the airport and taking the bus to and from the hotel with large suitcases is not an option as drivers don't let you get on. So I think having a car or getting airport pick-up/drop-off service would be recommended unless you travel light. There is only 1 restaurant and 1 cafe within walking distance from the guest house, which doesn't give you a lot of options in terms of food. Also the prices at the restaurant was quite high comparing to other restaurants in other areas of the island as well as on the 2 neighboring islands that we have visited. We really enjoyed our stay at L'Oasi since the owners were so friendly. We love the smell of bacon and sausage in the breakfast room in the morning. The welcome drinks were very refreshing and the guest house is within a short walk from a nice beach. The only downside is its long distance from the airport and the local bus only stops there once every hour. If you have big suitcases, the drivers do not allow you to be on the bus. So beware if you are planning to take the bus from the airport to the guest house. Also, sometimes bus drivers don't stop for you. We had 2 incidents when the driver just decided to skip our stop and we had to wait another hour for the next bus, so please extra time if you want to stay here and use the bus.